We needed to use the watercress before it ran out, and a cold day made putting on the oven quite attractive. The watercress cost $1.96 and we shared about ¼ or 25c per serve. We enjoyed this roll a lot for $1.80 per serve. 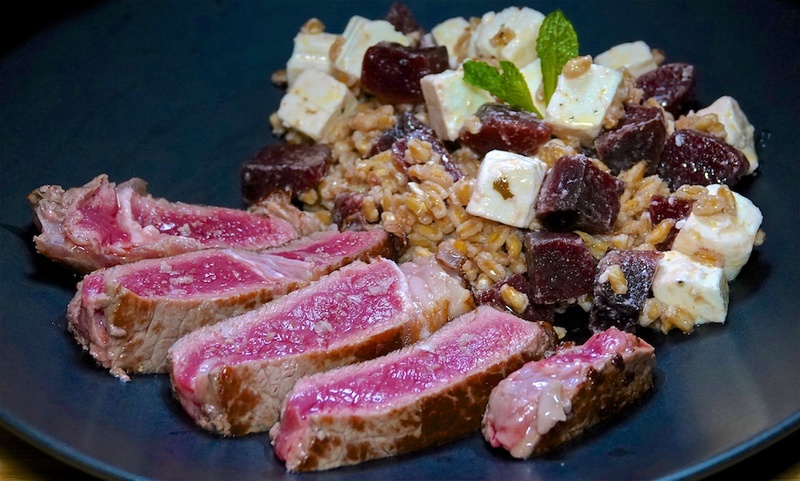 This “Thursday Night Steak Night” was a grilled rib eye with a farro, pickled beets and Feta salad inspired by a salad we had at Taste of Tassie. Beets in vinaigrette were $1.69 and we used 1/3, or 28c per serve. We really liked this salad because the farro is a toothsome base for the tart pickled beets and the creamy feta. It paired well with the perfectly cooked (for us) dry aged rib eye for $10.31 per serve.